The summer solstice is just ahead and here on the central California coast the weather is finally warming up and drying out. Spring crops, like fava beans and green garlic, will soon give way to summer squash, green beans, and cucumbers. In Connecticut, where I grew up, the growing season is just beginning. My Dad used to plant his vegetable garden every Memorial Day weekend. 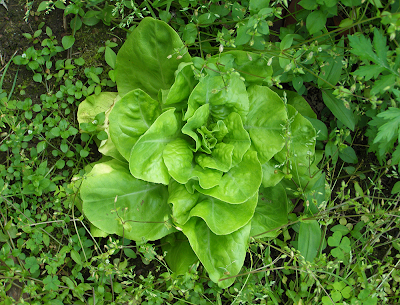 Now that he is gone, the garden had another idea this spring and popped up a volunteer lettuce plant in mid-May. My sister, our husbands, and I made a meal of this, along with some fresh spring shad, before saying goodbye to Dad’s garden. The hotter weather has me thinking about salads and slaws, and anything eaten cold. Pursuing this “cold” idea, I discovered that my favorite radicchio recipe, Sicilian Sauteed Radicchio, is quite good cold, as refreshing and sweet-bitter as a chilled sugared grapefruit! This week it looks like salads, chilled roasted meats, and maybe some pickled radishes from a vintage Hawaiian cookbook I picked up. And I do wonder about scaling down a recipe for chocolate-dipped strawberries. In the past I’ve made quantities of 24 – 48, a major commitment of time and effort. How much simpler would it be to dip only 8? Simply steam: broccoli, spinach, cabbage?